The Waterloo & City is only 1 � miles long, but for more than 100 years it has been a very important line, carrying far more passengers than many much longer lines elsewhere. It owes its origin to the fact that, like most other main line railway terminal stations bringing passengers from afar to the city of London, the Waterloo terminus of the LSWR was still a long way from the real centre of the city. 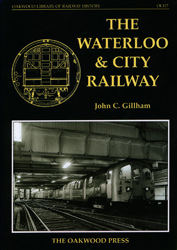 This book sets out to record a century of history of the W&c and transport historian John Gillham has done so very thoroughly. Th W&C remained until recently under the ownership of the LSWR and its successors, and it was the only underground railway never to come into the empire of the Underground or the Metropolitan companies, nor therefore of the London Passenger Transport Board, not at any rate until nearly 101 years after the passing of the Act which created it, but in 1994 it was transferred to the London Underground. The line today, and its two stations, are still very much the same as when first built, with various small improvements, especially better access facilities at the city end, and it was completely re-equipped with new rolling stock in 1940 and again in 1993. The W&C has always been physically isolated from all other railways, both surface and underground. Over the years there have been several proposals to extend it to join up with other railways, but all have been investigated and rejected. Its total physical isolation has always meant that rolling stock cannot be taken onto or off it by ordinary methods, instead this can only be achieved by hoist or crane, which is quite a major operation. A5 format, 464 pages, more than 230 photographs, maps, etc.